Everybody (except Israel) wants peace, freedom and democracy for all. Herr Hitler wrote Mein Kamph and many took it lightly; we were privileged to experience the pleasures of World War II. The Koran has some really cool, funny stuff as well; many take it lightly so that we may eventually experience similar joys. Fun loving folk just love to joke around and rather than be prudes we should all try to understand their subtle humor; it’s a mark of high intelligence. In view of the many precedents in favor of tolerance and good humor, it is necessary that we accept what Hamas says about Israel and peace as having been made in the spirit of good fun. As all right left thinking people in our brave new multicultural world know, everyone (except Israelis) wants peace, freedom and democracy; there are only petty, easily resolved, simple misunderstandings about how to achieve them. Hamas co-founder Mahmoud Zahar on Wednesday told the Maan news agency Hamas would never recognize Israel. Saying Hamas would accept a PA state based on the “1967 borders,” Zahar made it clear a peace accord would only serve as a prelude to Israel’s destruction. “If the Palestinian state does not encompass all of Israel the next generation will liberate the land,” Zahar said. Hamas will be such an incredible partner for peace with Israel that the process may eventually become a musical comedy. One thing is certain: our world is facing a great revolution. The only question is whether the outcome will be propitious for the Aryan portion of mankind or whether the everlasting Jew will profit by it. [T]he Jew is always spreading falsehood and that if he tells the truth on some occasions it is only for the purpose of masking some greater deceit, which turns the apparent truth into a deliberate falsehood. The Jew is the Great Master of Lies. Falsehood and duplicity are the weapons with which he fights. The NAZI concentration camps of World War II (which of course did not exist), where arbeit macht frei, were world class vacation spas much enjoyed by countless Jews and others. The privileges of being there were great, not in the least because accelerated learning and enlightenment were available for all without regard to race, religion or ethnicity. We must understand the subtle humor of those who joke that they want to eliminate Israel; they merely yearn for peace — change they can believe in. A Palestinian state is a necessary first step to that end. For us even to consider other possibilities would be unenlightened. Had President Obama not insisted on the 1967 borders as the starting point for negotiations concerning a much needed free, democratic and prosperous State of Palestine, he would have neglected his duties as the acknowledged leader of the free world. He would never, ever do that. His liberal understanding of history is legendary and he must never yield to the petty ignorance of a crass, non-pragmatic politician such as Israeli Prime Minister Netanyahu, who knows nothing about the situations in Israel and Palestine. How dare he or anyone else presume to lecture our great, dear young leader! 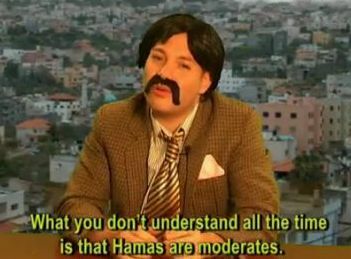 The really funny thing about the guy in the first video is he doesn’t seem much different from real Palestinian spokespeople. The goals of Hamas, which are pretty widely supported among Muslims, are unambiguous. Obama with his typical moral equivalence viewpoint is really playing with fire, and a whole lot of people could get burned as a result. The terror trio in the last video is classic. Probably wouldn’t be too hard to convince the real national leaders to make the same video — well, maybe not Turkey. I just wrote a post based on the same article you quote from Arutz Sheva. I hope nobody minds me leaving the link, but feel free to delete in case you do. Great article, Clarissa. Thanks for the link. I don’t know what “some people” are thinking, if “thinking” is the correct word. It seems to me that they are emoting rather than thinking, based on what I haven’t the foggiest notion; perhaps you do. Israel is the only reasonably free and democratic nation in the region. If the “Palestinians” take over and behave consistently with their recent behavior as seems quite likely, Israel will be no more; neither will freedom and democracy in the region. Most of us, regardless of ideological orientation, seem at least on some plane to value both. That said, I have a very religious Jewish friend in Samaria; I value his friendship highly. He bases much of what he writes on Old Testament writings and prophecy, the Talmud and other ancient religious writings; they mean much to him and very little or nothing to me, an Agnostic. Recognizing as I do that Israel is, and to survive most remain, a free and democratic Jewish state, I have suggested that he at least tone down those aspects of his writings and focus principally on other, non-religious, aspects of what he and I agree is their legitimate struggle. He has a very keen mind, is a good and honorable person and is quite articulate. He also knows a lot of what is happening in Israel. He might well convince many more people who now don’t much care about Israel’s continued existence or believe (note, I did not use the word “think”) that all people throughout the world cherish the same freedoms and will behave accordingly. Unfortunately, is seems quite unlikely that such is the case. If Israel is overwhelmed, the consequences will be very bad, and not only for those in Israel. This, I suggest, would be the best focus for my friend, for Prime Minister Netanyahu and for others who favor Israel’s continued existence over the alternative(s). I wrote my article recognizing that the audience at Pajamas Media to which it was principally directed would generally be in agreement with it; I was preaching to the choir. I ridiculed at least by implication those of a different perspective and made no effort to convince them. More needs to be done for those of different perspectives and I hope that you will try. As you can see by this map, Israel represents such a huge threat to the Muslim world that it simply cannot be allowed continued existence. Yes, Israel is such a hateful place that Maronites and even Muslims enjoy their houses of worship without interference. The only other places in that part of the world with significant non-Muslim populations are Lebanon and Egypt, and the Christians in Lebanon and Egypt are persecuted no end. Yep. And we should certainly believe them when they say what they say about destroying the only reasonably free and democratic society in the middle east. The bases for their statements are beyond me, but then so were Herr Hitler’s. We fail to take them seriously at our risk.